Civics have been selling well for decades, and Honda remains a top-seller of quality, reliable vehicles. 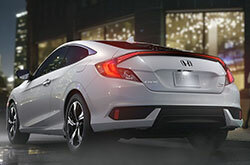 Honda makes sure the Civic earns top crash scores, and it offers the latest avoidance features. With its affordable pricing, the 2018 Honda Civic really is the total value package. Whether you choose the 15 cu.ft. trunk and a 25 cu.ft. cargo hold, you've got plenty of room for luggage with either the Civic sedan or hatchback option. LX sedans have automatic climate control, split-fold rear seats and a USB port. A five-inch central audio display lets you see clear images from the rearview camera. Civic LX hatchbacks and Civic LX-P coupes also have push button ignition, a remote starter and a sunroof. Sport hatchbacks have a different look to go with their more powerful engine. EX sedans have these features but also add an eight-speaker audio system, a more advanced rearview camera system and two USB ports. The seven-inch touchscreen includes HondaLink, Apple CarPlay, Android Auto and satellite radio connectivity. EX hatchback editions add dual-zone climate controls. EX-T Coupe and Sedans have heated front seats. 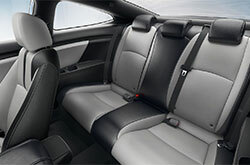 Leather upholstery and a power-adjusting driver chair are EX-L sedan standards. 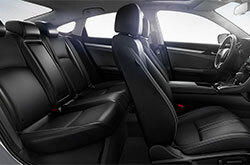 Touring sedans and Sport Touring hatchbacks add a power passenger's seat and heated second row seats. With amenities similar to the EX-T, the Si sedan has its own special sport seats, a unique instrument panel, and imitation carbon-fiber trim elements. The R is in line with the Sport Touring model, but it also has special styling. When it comes to performance, the Civic works hard to fulfill modern expectations of good fuel economy and engine power. A 174-horsepower turbo is a good example. EX-T models earn 35 mpg highway* and include a new power steering rack that's more responsive to the driver. The fuel-efficient base engine earns 158 horsepower. Shoppers can choose a manual or CVT automatic. On the other end of the spectrum, you'll find the Civic Type R hatchback. This 2-liter Turbo uses valve-timing to create peak performance. Drivers command 306 horsepower and 295 lb.-ft. of torque. Mated to a six-speed manual transmission, the front wheel drivetrain benefits from a helical limited-slip differential. For grip, you get a sport-tuned suspension. In the middle of economy and speed, you'll find the Civic Si sedan. Not only does it have an adaptable suspension, but it lets you go back and forth between normal and sport modes by simply pushing a button on the shifter. The Si turbo-four generates 205 horsepower and controls it with a short-throw manual transmission. Available as an affordable option on the base edition, Honda Sensing includes visual and audible warnings about dangers to the front and sides. If the Civic veers out of its lane, the watch will sound an alarm. Stopping or slow traffic may cause another alarm thanks to the forward collision system. An automatic braking response may make the difference between a crash and a near miss. EX and higher editions have Honda LaneWatch on the dash. 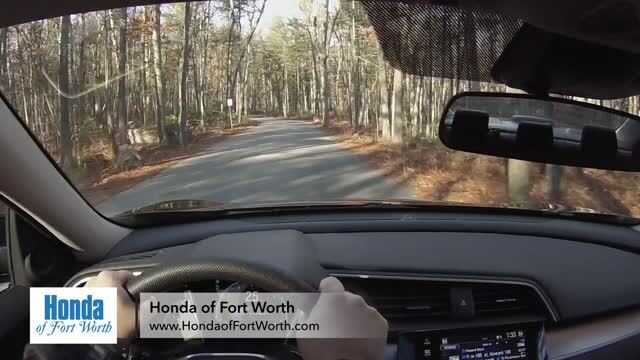 A camera on the passenger side mirror eliminates the driver's biggest blind spot. 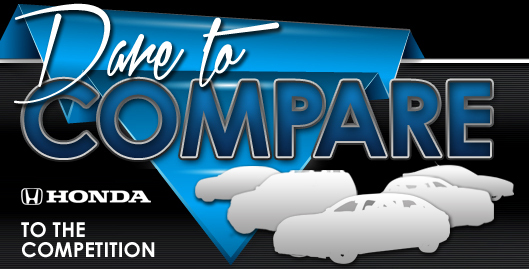 With so many choices in the Honda Civic family, our knowledgeable staff can find the right match for your needs.